Book Description: What happens when you can’t do the one thing that matters most? 12-year-old Hope lives in White Rock, a town struggling to recover from the green bombs of World War III. The bombs destroyed almost everything that came before, so the skill that matters most in White Rock—sometimes it feels like the only thing that matters—is the ability to invent so that the world can regain some of what it’s lost. When bandits discover that White Rock has invented priceless antibiotics, they invade. The town must choose whether to hand over the medicine and die from disease in the coming months or to die fighting the bandits now. Hope and her friends, Aaren and Brock, might be the only ones who can escape through the Bomb’s Breath and make the dangerous trek over the snow-covered mountain to get help. For once, inventing isn’t the answer, but the daring and risk-taking that usually gets Hope into trouble might just save them all. My thoughts: I received this book from Netgalley to review a very long time ago. My best intention was to read it right away, but it didn't work out that way. This is a tween to YA dystopian book. It was very well written and really captured my attention and imagination. I wish that I had read it sooner! This book takes place after WWIII. The Earth has been drastically altered and people live with little to no technology. People live in fortified villages to try to stay safe from bandits who roam and steal what they do not produce themselves. This book is full of adventure. Hope and her friends are early teens who have to use skills the cultivated on the sly to save their town when bandits strike. I think this is a wonderful book for kids of all ages (that includes adults). It does contain non-graphic violence. 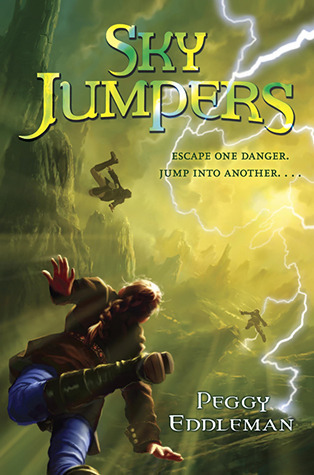 About the Author: (Taken from Goodreads) Peggy Eddleman is the author of the middle grade post-apocalyptic adventures SKY JUMPERS and THE FORBIDDEN FLATS (Random House). 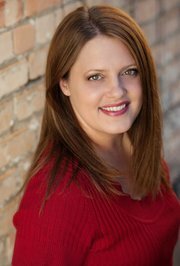 She lives at the foot of the Wasatch Mountains with her three hilarious and fun kids (two sons and a daughter), and her incredibly supportive husband. Besides writing, Peggy enjoys playing laser tag with her family, doing cartwheels in long hallways, trying new restaurants, and occasionally painting murals on walls.